Here’s this weeks Halo Waypoint Bulletin! Looks like their introducing some nifty graphics into it so go and check it out! Also they have segment where they interview Greg Bear, author of Cryptum, Primordium and the soon-to-be-released Silentium. All can be read here, but on to the highlights! Lightrifle – one shot anywhere kills. 5 second Respawn, touch flag return, no motion sensor. Flag carrier keeps Lightrifle out while running the flag. Rocket Launchers, Railguns, and Jet Packs. Random Weapons. 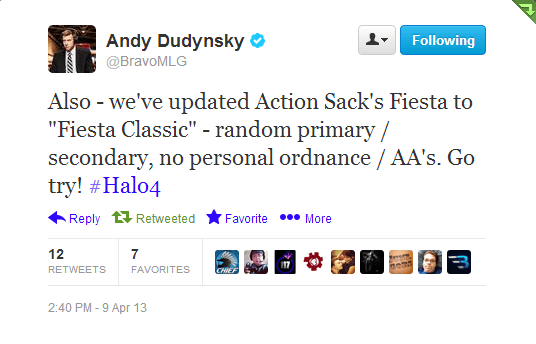 Expect to be killed by everything from the Halo 4 sandbox in one game. And more to come! Even by Monday (March 11th)! They are also working finalizing the FFA playlist to incorporate both Infinity Rumble and Rumble pro along with specifically tuned Majestic DLC map variants. They also stated they are actively working on a “BTB Objective” like playlist. No set date.